"The first performance of Das Rheingold, the prologue to the trilogy entitled Der Ring der Nibelungen, terminated two hours since. It was witnessed by an audience more, representative and critical, perhaps, than will ever be brought together again"
The heat, however, was intense, for the doors being closed and even overhung with tapestry, and there being no windows or ventilating apparatus of any sort, the air was never renewed. "The Emperor William, who had reached Bayreuth on the afternoon previous, stepped into his box at 7:05 o'clock, and was greeted with general applause, and, it seemed to me, with really heartfelt hochs. " 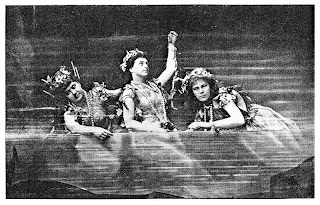 ” The curtain rises upon a submarine picture, showing the depths of the Rhine, a rock upon which lies the charmed gold being in the cen­tre, and the river surrounding and covering it and reaching to the top of the stage." 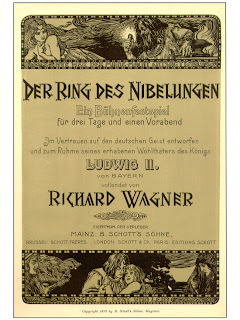 The first performance of Das Rheingold, the prologue to the trilogy entitled Der Ring der Nibelungen, terminated two hours since. 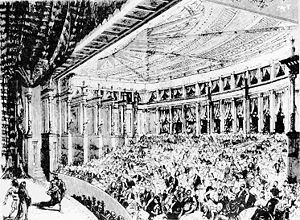 It was witnessed by an audience more, representative and critical, perhaps, than will ever be brought together again; the Emperor of Germany and a brilliant suite occupied the Fursten Gailerie; the Emperor of Brazil was present; a number of German grandees were scattered about the auditorium; France, England, Italy, and America had deputized musicians and litterateurs to enjoy, and, in some instances, to dissect, the work and its rendering; the assemblage, in a word, was one which in political, artistic, and social distinction was; as brilliant as even Herr Wagner could have anticipated. “ Das Rheingold” commenced at 7:15 o'clock, and the curtain fell at 9:30, the performance progressing without interruption. Upon an event of equal magnitude it would be more grateful to dwell after a period of repose afforded opportunity for reflection. This satisfaction cannot, however, be afforded me at present. No one in Bayreuth can tell with absolute certainty when a letter ought to be mailed to reach London in season for the steamer, and it is therefore necessary tonight, as it will be on the three succeeding evenings, to promptly take pen in hand and render such an account of the opera and its interpretation as the circumstances will permit. In this communication as well as in the three which are to follow, I shall confine myself wholly to describing the works - brought out and their execution, and I shall only make such critical references as ought to accompany the current record I desire fit to supply. It may be well to mention, here, that, a record of this sort can now for the first time be prepared. The perusal of the scores of Herr Wagner’s operas, a summary of their plots, and even regular attendance at the rehearsals which have been in progress, this year, since June, are wholly insufficient to warrant the formation of a judgment upon the music and the dramas to the production of which Herr Wagner has been looking forward almost for a quarter of a century. Now only, the dramas and their musical illustration having been made known under circumstances such as none but the most ambitious of mortals could have dreamed of, can statements be offered and opinions ventured. At the close of the series I shall be in a position to set forth definitely the impression of “ Der Ring der Nibelungen” and to express views as to the probable or possible influence of the Fest which has been so long awaited. In this letter, then, I shall merely endeavor to convey an accurate idea of the representation and its incidents observing, by the way, that I shall not allude except casually to the stories of “Das Rheingold" or of the other operas of the cycles, these having appeared in The Times some days ago. There is no overture, in the common sense of the term, to “Das Rheingold,” nor to any of the operas of the trilogy, but merely a brief prelude, imitative in “Das Rheingold" of rippling waters, and suggesting the accompaniment to the “bathers' chorus' as it is called, in tho French score of “ Les Huguenots.” The curtain rises upon a submarine picture, showing the depths of the Rhine, a rock upon which lies the charmed gold being in the cen­tre, and the river surrounding and covering it and reaching to the top of the stage. The effect of the imitative music, added to that of tho scene, was excellent, and the weird but tuneful strains allotted to the three Rhinedaughters, as they swim about the rock and keep guard over tho treasure, are exceedingly sweet and pretty. Tho scene with Alberich is only worth notice because of the measure of the Rhinetochter, such as one seldom finds in Herr Wagner's writings, and the more welcome in that the voices aro now and then allowed to mingle in dainty harmony. Alberich's music is characteristic enough, but it is not especially impressive, although certain bars accompanying and imitating tho sliding of Alberich down the rocks as he pursues the fleeting maidens may be considered by Herr Wagner’s admirers as very significant and dramatic. Later on is a fresh and bright fanfare, illustrative of the gold of the Rhine glistening in the first beams of the morning sun, and the greeting of the treasure by the water-maidens is also pleasant in its freshness and tunefulness. Alberich's curse of love is as vigorous as needs be, but, although its theme recurs a hundred times during the progress of the Opera, it can only be said,to have the conventional meaning assigned to it. Alberich's flight with the treasure closes the scene. Continue reading at the New York Times (link will open a PDF with a facsimile of the original article).